​Awaken the life energy of your cells & experience deep levels of relaxation and healing with tuning fork sound therapy. Sound and vibrational healing accesses all levels of a person's consciousness to free blocked energy & create openings for personal transformation and healing. 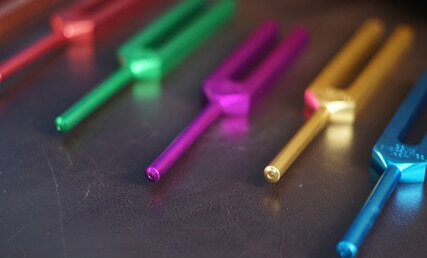 Solfeggio Tuning Fork therapy uses the power of the ancient solfeggio frequencies. These frequencies make up the ancient 6-tone scale thought to have been used in sacred music and chants, but lost long ago. The chants and their special tones were believed to impart special spiritual blessings when sung in harmony. Each Solfeggio tone is comprised of a frequency required to balance your energy and keep your body, mind and spirit in perfect harmony. We store life experiences, emotions and thought patterns as energy patterns in our energy anatomy. Some of those experiences, especially negative ones, create blockages, interrupting the free flow of energy in our lives. The other factor that limits our energy flow is that many of us live at “survival” level. We access and use only the energy needed to get through the day. A vibrational tuning activates the energy in the root chakra and raises it up through the other chakras to awaken and balance them, allowing the energy to flow freely. When energy flows freely, new choices in our lives are awakened and we have the new-found energy from within to make the changes we want, or need to make. Also, each time a tuning is received, it propels us towards a raised consciousness & helps our bodies adjust to and integrate the higher vibrational energies that accompany a raised consciousness. Science is now making it increasingly clear that it is possible to therapeutically impact physical and emotional issues by affecting the subtle energy bodies. The etheric body is said to be a subtle energy template that guides the development of the physical body. Distortions in this etheric template may be predictions of illness months prior to it becoming manifest in the physical body. Working with the tuning forks, distortions in the etheric field can be detected, and allowed to be let go, re-patterning the distortions, and changing the anticipated physical outcome. This makes tuning fork therapy preventative work as well, and complimentary to other modalities. These sacred tones actually serve as a “vibrational bridge” to holistic reintegration of the physical, mental, emotional, and spiritual aspects of the individual. ​Provides deep relaxation and relieves long-term stress. Promotes healing on a cellular level. Improves mental clarity & left-right brain integration. Activates higher vibrational frequencies and realigns the body structurally & energetically. Clear and balance the energy centers, releasing old patterns & providing more space to establish patterns that serve you in a more positive way. Releases emotional, mental, physical traumas. Release blockages in the energy bodies. Assists one in connecting with Source. Fully integrates body, mind & spirit.